Warsan Shire and Beverley at the storymoja hay festival, Nairobi. Photo by Juliet Maruru I have cried so hard because of the situation at Westgate Mall in Nairobi where many people were held hostage, others killed and scores injured in a grim, horrendous terrorist attack. It’s not because I was at the mall at the time. 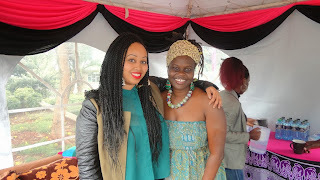 I was at the the Storymoja Hay Festival just minutes away. I have cried for the children shown on the media, being carried away to safety, mothers covering their children and the entire scene of horror, uncertainty and blood. I have cried because I realize that some of the sentiments from people in my past filled with, wish we could grow old together and love you always fizzled in the face of today. In Nairobi. They either conveniently forgot I existed or something else was trending, like a video of a celebrity’s post pregnancy body. Despite this, the festival was a raving success especially at a personal level because I met Kwame Dawes. What a profound poet. A genius. A man. I met Warsan Shire. Glorious. Gifted. Dr. Neal Hall. Strong. Convicted. Teju Cole. Enigmatic. I was able to reach my own depths and rip out the enemies of success, or at least discover where they lay. Lots of the sessions amongst poems carried sentiments on healing and forgiveness and how poetry plays a role in dealing with trauma. It resonates heavily after the terrorist attack. In no uncertain terms, 21 September 2013 will be embedded as a horrific reminder of this seige and at the same time, when I laid off the clutter in my life of excess people, pretenders, no-gooders. I’m done. I will return to the Storymoja Hay Festival next year most definitely. I pray now that those injured are healed and that the comfort that only come from a spiritual source connects with those grieving over the loss of loved one. May this uncertainty become clearer to all of us and may Nairobi, the entire Kenya and East Africa, never have to be a part of this again.